No Good Deed Goes Unpunished. Most Good Deeds Are Very Awkward. Let’s Make Muffins. Saturday morning I went for a run through our pretty, pretty neighborhood with my boyfriend. Usually, after these jogs/walks/eventual gasp-filled staggers, I try to persuade him to steal someone’s copy of the New York Times for me (jokingly, lest anyone in my ‘hood suspect their stolen papers have been brought to my lair). Of course, he never complies, beacon of morality that he is. So, on this particular morning, we happened to pass a neighbor who was retrieving her copy from the doorstep and noticed that she had received two papers for some reason. We alerted her to this and she was generous enough to give us her second copy. Nice, right? We introduced ourselves, and eventually to show my gratitude I offered to make her some muffins. I’m sure none of us took me very seriously (yes, I am including me). Still, Sunday morning, I awoke with the intention to bake. Like I said, I’ve missed it. And I’m trying to be a woman of my word these days. And she gave us the Sunday Times! She deserved some baked goods. Blueberry baked goods at that. My new favorite cookbook once again assists. 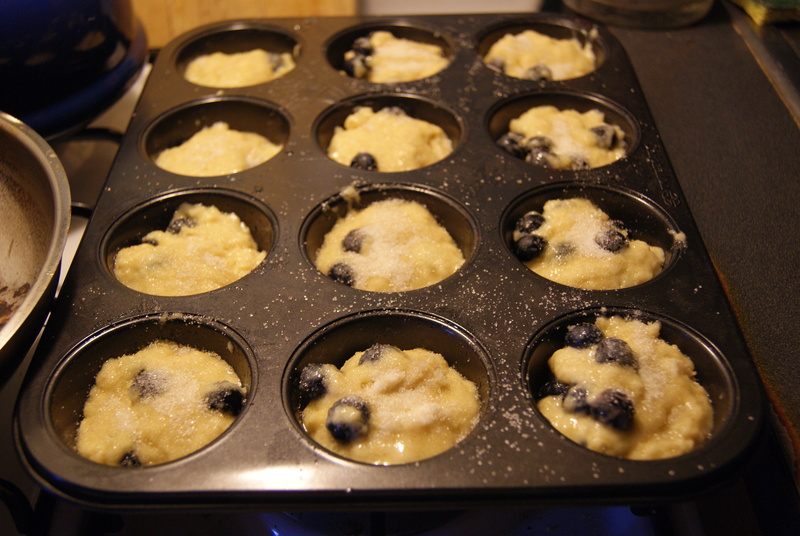 Preheat oven to 400°F and grease the bottoms of a 12-cup muffin tin. You know what I found out from this very book? Greasing the sides of pans when making muffins or breads can actually burn and crisp up the sides, giving an unwanted crust on your goods. So only grease your bottoms. That was weird, I realize this. 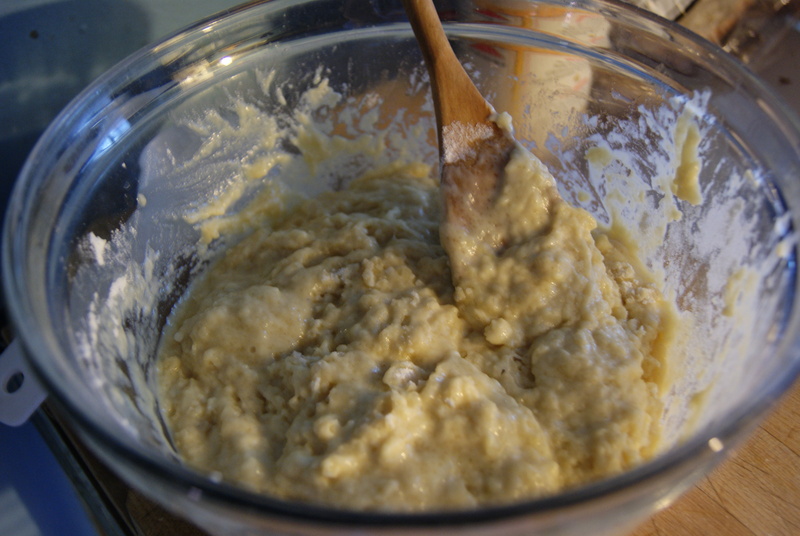 In a large bowl, whisk together milk, oil or butter and egg until fully mixed. Then, all at once, stir in flour, sugar, baking powder and salt. Now, and this is important, stir until you’ve got a lumpy mess. Do NOT try to smooth this batter out. Stir just until the flour has all been moistened, or you’ll come out with a dozen dry blueberry rocks. Not delicious. Next, very carefully fold in your blueberries. Try not to upset the batter too much, as we don’t want to overmix. 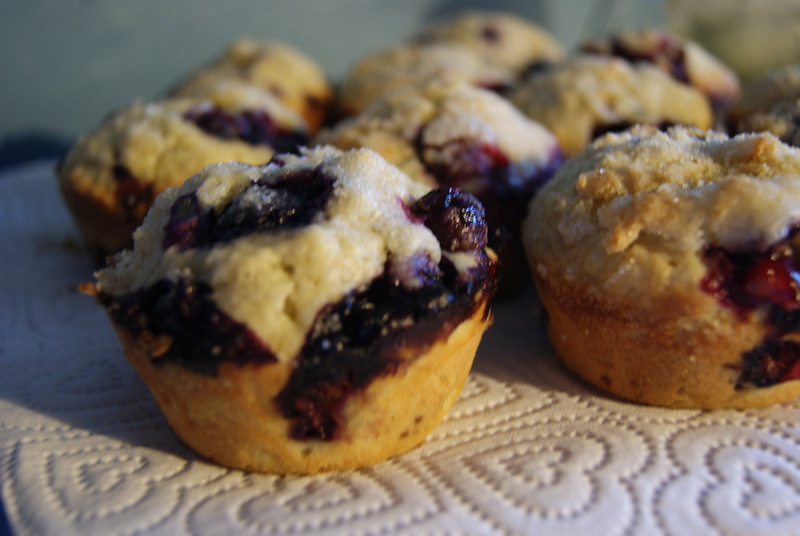 Evenly distribute among your muffin cups, and sprinkle the tops with coarse or granulated sugar. Send these into the oven for about 20 to 25 minutes, rotating the pan halfway through baking, and remove when the tops are golden brown. Let these cool for about 10 minutes in the pan, then pop out and eat while warm. Oh, please eat them warm. 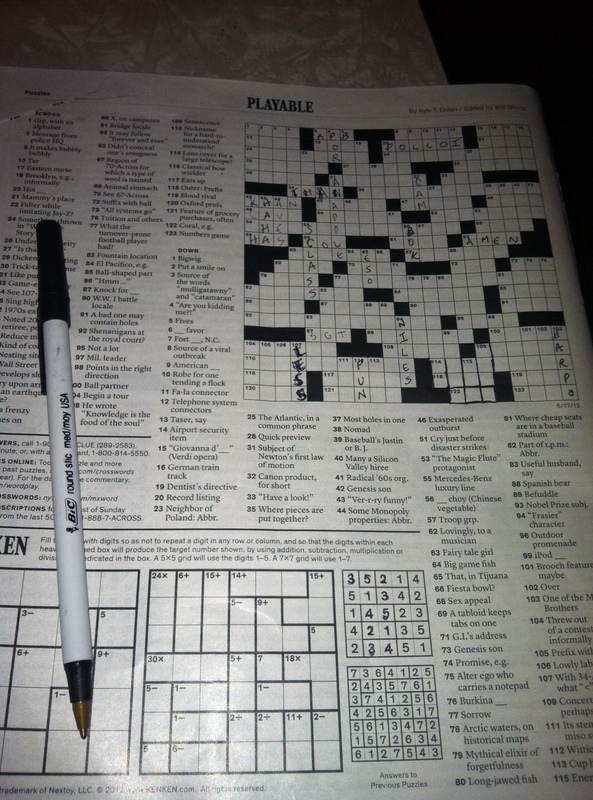 Your generous gift of the Sunday Times did not go unnoticed. 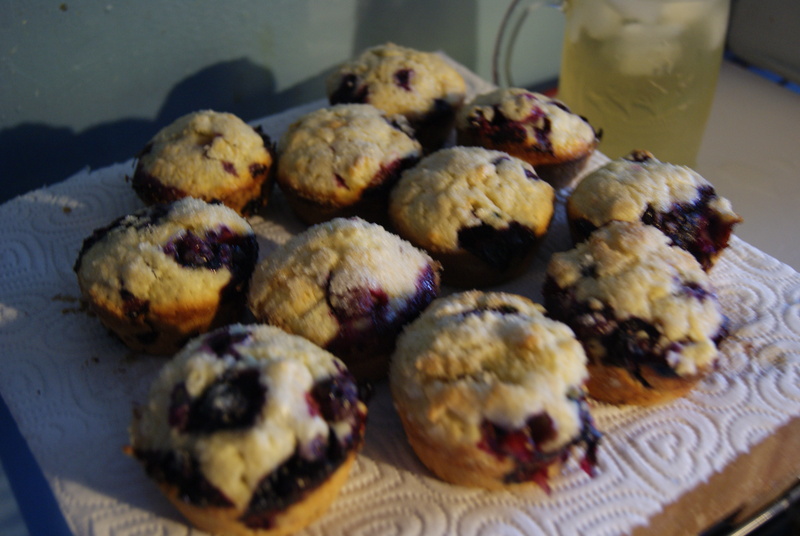 Here are some muffins. We’re even now. Don’t smile at me on the street. Confession time: I am a painfully shy human being who often comes off as uptight, mostly because I try not to engage people… mostly because I’m afraid people will hate me once I engage. Really. Many of the people I’ve grown close to over the years have said that when they first met me, they thought they’d hate me. I bet some of them even did hate me until I decided to open my mouth and my heart (awww, precious). It’s something that I’m still working on correcting, but for anyone who reads this before meeting me, I swear I’m nice, and I’m sorry I scowled at you. BF helped me muster up the courage to deliver the muffins in person. I can’t say I wasn’t uncomfortable and super awkward about the whole thing (I tend to do this weird, nervous laugh that I can’t suppress, and that I am fairly certain I’ve inherited from my father), but I am happy that I kept that promise. I’m also glad we got to know our neighbors, and happy to report that as far as I know, they don’t hate me! Hooray!